1985 - the year the first cell phone call was made and compact disc’s first showed up on the high street and anyone who was anyone tried the “truffle shuffle”, which means the timeless “cult” classic that is The Goonies is 30 years old! 1985 - the year the first cell phone call was made and compact disc's first showed up on the high street and anyone who was anyone tried the "truffle shuffle", which means the timeless "cult" classic that is The Goonies is 30 years old! Now, boy do I feel old! Like now, back in 1985, developers were making big news reclaiming tired old towns, bulldozing them and rebuilding more stylish places to live. One such place is Goon Docks of Oregon, the playground of a gang of kids collectively known as The Goonies. Led by asthmatic Mikey (Sean Astin), they all know time is running out before the bulldozers arrive, and, chances are, with it, friendships lost. Mikey, though, has an inkling that a celebrity pirate, "One Eyed Willie", may well have left buried treasure in the surrounding area, and if they found it, it would be the answer to all their troubles. And, with a chance finding of an old map, Mikey needed no excuses to try and prove the legend is true. Following the clues, Mikey and his gang, Brand (Josh Brolin), Chunk (Jeff Cohen), Mouth (Corey Feldman), and Data (Jonathan Ke Quan), end up at the site of a disused diner, currently the hide away for a small criminal gang the Fratelli family. Through more luck than judgement, the kids make it to the secret caves, and hopefully treasure. What ensues next is a classic chase between the Goonies and the Fratelli's, followed closely by Chunk and the somewhat disfigured Fratell, Sloth (John Matuszak). With tricks and traps all along the way, you never really know where it will end. Sound and picture quality on the 30th edition disc is as you now come to expect very good, and consistent throughout the 114 minutes of the film. Die hard Goonie fans will enjoy the many extras and exclusive merchandise. I particularly enjoyed the 1985 The Goonies Making Of mini magazine. The Goonies is one of those rare movies that will be handed down from one generation to another, loved by children and adults alike. And although it may not be the best movie you'll ever own, that doesn't stop it being a definite must own for your home entertainment collection. The perfect family movie. • Cyndi Lauper music video – "The Goonies ‘R' Good Enough"
Download Goonies from the iTunes Store in Digial HD. 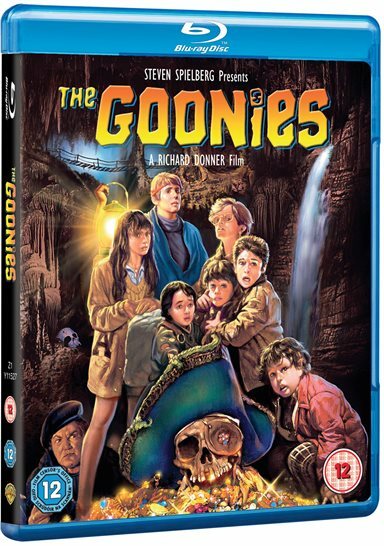 For more information about Goonies visit the FlickDirect Movie Database.